Finally, something you can use in the comfort of your own home GearJustForYou's portable Laser Skin Spots Removal Pen! There's always on our skin no matter how big or small. Do you have moles, tattoos, or skin blemishes that you hate? Do you ever wish there was an easy, way to get rid of them without having to pay doctors hundreds if not thousands? ✔️ Nevus, Age Spots, Warts, Birthmark. Introducing the Home Laser Removal Pen. Using FDA Approved Picosecond Technology it fires rapid and powerful laser emissions to break up dark pigments without damaging any skin tissue. Our Home Laser Removal Pen is made use of thermal therapy and blue light together. You can remove dark spots, Nevus, Age Spots, skin tags, warts, tattoos, Birthmark, Skin Pigmentation anytime at your home. You are no longer to pay a high price for time and money. It is safe and no side effects. You can remove spots without burning the skin. Using high-tech, electric ion carbonation functions to instantly sweep warts, age spots, flat skin tags, etc. Removal can be achieved quickly without bleeding. The Picosecond Laser Pen utilizes FDA approved & clinically validated technology laser for tattoo removal, laser freckle removal, and other melanin removals. Pico-second technology uses powerful impulses of light at a wavelength designed to ONLY attack specific pigments - leaving your skin pain free during treatment. This means skin won't be burned or damaged, only a gentle tingling sensation will be felt during operation. To begin to see results we recommend ; 1-2 exposures per week, repeated for 12 weeks. This gives all pigments adequate time to begin denaturing and cause visible fading. This process is known as Photo-ablation. Below: A 4-month commitment to the Picosecond pen has almost completely removed Davids Neck Tattoo. With the traditional Q-Switch Technology, these results would have cost thousands, with extensive healing time and high risk of infection. 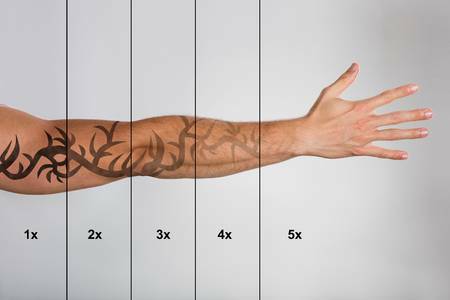 Continuous and repeated exposure to these wavelengths causes pigments to weaken and break apart, painlessly and gradually fading your tattoo or blemish. Continue application until the tattoo has faded completely, increasing intensity only when necessary. The image below demonstrates the fading you can expect with each month of treatment. Avoid long visits to the doctor and painful procedures with a l ong healing time. This device is safe enough and effective in the privacy of your own home. The laser does not interact with human tissue. Have piece of mind that FDA Approved Picosecond Technology will keep your skin safe and your body blemish-free. Sleek, Compact durable design meaning you can take it anywhere and pass it on to friends for years to come! Easy to use LCD Interface: providing a stress-free user experience that anyone will be able to operate confidently. Efficient: Specially designed wavelength of the laser means this pen is very effective in dealing with any dark spots on the skin (tattoos, moles, acne scars). Effective: No Pain From Proven FDA Approved Technology. Fast: Any dark spots, tattoos, or other skin blemishes can be erased. 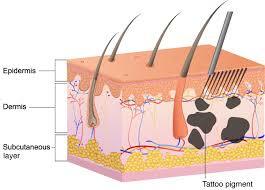 Safe: Using the Laser Removal Pen will not cause any damage to skin tissues. Safety Glasses are provided and the LCD Display built in to provide you with maximum control over the process. WARNING: DO NOT POINT PICO-LASER TO EYES, DOING SO COULD RESULT IN HARM. Use A Maximum Exposure Of 1-2 Seconds In Each Area. Take Breaks Of At Least 3 Days Between Each Session. Wear The Included Safety Glasses During Operation. Thank you. Excellent item, fast delivery, attentive seller. The product works well. Try, later отпишусь. Great thing and quick delivery!!! It took only 12 days!!!! Started my first session keep you up to date!!! Thank you for the professional delivery !!! Hands up!!!! After buying both the blue and red I can say that the blue one seems to work better on my tattoo that I’m trying to remove at least after my first try. Like you see on the pictures that I take after one use with the blue one you can see the small line that I point to on there. Just a fair warning, they are not joking about this hurting, this hurts like a MF. Getting the tattoo hurt but this is like at least double the pain. The second picture is done with the red one in the corner and you can barely see it. Red one might work better on a lighter colour. Shipping is very fast, track number tracked. The product corresponds to the photo. The laser works. You need to understand how and determine the power. Burns noticeably. Quality packaging. Included handle, charging and glasses. Instruction in english and chinese. It looks impressive, and then we will try in work. Very good new one item as in description, fast shipping and honest seller!!! 5 star for all, mostly recomended this seller/store. Very good, I hope it is as described! I have tried the red light and i preffer this, the blue light. If you are wondering which color to buy, choose blue light. The only bad thing is that it makes an intense beep everytime you use it, i have to wear earplugs. I use it for acne marks. It makes them disapear faster. i think it works! the packaging was good. product is in perfect condition. it feels the same as the tattoo removal i’ve had but a bit less painful. only difference i see is that after the treatment there is no “frosting” on the tattoo. i will update in a month if the tattoo has faded. Amazing product. Worked great with my microblading to fix it. Packed perfect, arrived to United States within a week. Very quick. Seller have been in contact all the time and sending updates about delivery of item. Also, very friendly and understanding person. I could track it easily. Totally deserve 5+ stars. Thank you. I am happy!